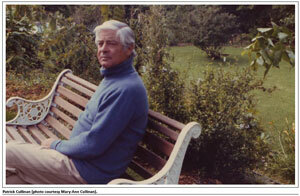 On 14 April 2011 Patrick Roland Cullinan died at the age of 78 in Cape Town. He had been ill for a number of years. His death, coming so shortly, a matter of days, after that of his friend and fellow poet, Stephen Watson, caused one website to quote T.S. Eliot's opening to The Waste Land, 'April is the cruellest month ...' There was exactness in this that had less to do with the reference to the month and more to do with the lives of these two men. As with Watson, so Cullinan's life was a life lived in, and in service to, poetry. Not only did he produce four distinct volumes of verse (which were collected in Escarpments [Umuzi, 2008]) but also what he called versions of poems by Eugenio Montale, Osip Mandelstam, Dante and Phil du Plessis. As poet, editor, publisher, and then lecturer and novelist, Cullinan became part of the South African poetic canon and contributed substantially to the country's literary legacy in general from the early 1970s. With Lionel Abrahams he launched the Bateleur Press in 1974, ostensibly to publish the short stories of their friend Barney Simon which appeared in the collection, Joburg, sis! Bateleur went on to become a considerable imprint bringing a host of new voices into print, among them, Peter Strauss, Mike Kirkwood, Walter Saunders, Chris Mann, Peter Wilhelm, and with Bateleur's last book, Stephen Watson's first, Poems 1977-1982. Not content with this contribution, Cullinan founded a literary journal, The Bloody Horse, in 1980 and produced six numbers. For ten years from 1982 he taught in the English Department of the University of the Western Cape where his lectures and his generosity towards his students and young writers became a hallmark of his tenure. Born in Pretoria in 1932 into the middle-class ethos of a diamond-mining family (the Cullinan Diamond was named after his grandfather, Sir Thomas Cullinan), he was schooled in Johannesburg before being sent to England to complete his education at the public school Charterhouse and then Magdalene College, Oxford, where he took a degree in modern languages, reading Italian and Russian. On graduating, Reuters offered him a job as their Moscow correspondent but he turned it down to return to South Africa. His years in Europe had deeply instilled a European tradition but he felt the need to re-enter the land of his birth. At first he worked as a sawmill owner in the Mpumalanga Highveld and it was there that he came to a decision which was to influence his life and work. Yet throughout his coming writing years, he seemed to be engaged with this decision. Horizons and escarpments would feature in his poetry, those transitional places, redolent of a poet alone and not entirely at ease. Indeed from his first published poems there is an undercurrent of anxiety that for all Cullinan's ironic distancing, his lyricism, his metaphysical sensibility, haunts much of his work. These shadows can be read as political allusions but they are also more than that, they are what Watson called 'the unquiet spirits' that haunt Cullinan's verse. To talk of 'literature', of good writing, of art may be obscene or almost obscene in a society as self-destructing, engrossed in conflict as this one is. But the important word is almost. For however cluttered by violence and potential annihilation a society may find itself, it is the writers and the artists who portray the reality of this process ... There are multiple ways of telling the truth. This excerpt can be read as a statement of intent that was to find its expression in his verse as he crafted resonant and poignant works that went to enrich the South African poetic landscape. Nor were his efforts unrecognised. For his own poetry and those versions from the Italian he received three Pringle Awards, a Slug Award, the Oliver Schreiner Prize, and, in April 2003, the republic of Italy conferred on him the title 'Cavaliere'. But Cullinan's influence and awards extended beyond poetry: his biography of Gordon the traveller and soldier, Robert Jacob Gordon 1743-1795: The man and his travels at the Cape, garnered him the Cape Town Historical Society's Merit Award, and his short story 'There and Here', described as 'rigorously examining deep layers of moral experience', won the 1989 Sanlam Literary Award. His longer prose work, the novel Matrix, appeared in 2002, to considerable acclaim. History (and natural history) was never far from Cullinan's imagination. It is there in his poetry, never more so than in the poem 'M le Vaillant' where the 18th-century French explorer reflects on his travels, and so it was unsurprising that Cullinan should write a life of Gordon. However, if Le Vaillant is the only scientist to appear in the verse, Cullinan draws heavily for his imagery from the natural world and natural history. Weather systems, seasonal change, an ornithological fascination that has 'sunbirds in a bush, the cry of starlings' haunting his lines, and botanical references all add a dimension beyond the purely lyrical to his work. Even in the middle of Johannesburg a 'cold hyena' is heard whooping, a reminder of 'An Africa within. An Africa beyond.' Cullinan may be a poet of the city, but his cities have suburban gardens and jacaranda trees line the streets, and these anxious enclaves inevitably extend to seas, beaches, mountains, forests, deserts and places where people are simply figures in a landscape. And in this respect his figures (like that of Le Vaillant) are annotators of their worlds. Perhaps one of Cullinan's lesser known projects - for in every respect it was a project - was his relationship with the novelist Bessie Head. For years he provided her with material and moral support and her first novel, When rain clouds gather, is dedicated to Pat and Wendy Cullinan. In 2005 Cullinan published Imaginative trespasser: Letters from Bessie Head to Patrick and Wendy Cullinan 1963-1977 which laid out the nitty-gritty of that project. And gritty it was - towards the end the relationship became particularly hurtful for Cullinan as Head turned on him, as she had done with so many others who cared about her. Compiling the 'letters' took courage and some altruism, but Cullinan was in service of a greater ideal: the country's literary legacy. Hence, too, his editing of a collection of essays, Lionel Abrahams: A reader, a tribute to his long-standing friend and colleague, and his collaboration with Watson on the 2005 anthology, Dante in South Africa. Cullinan's life was not without personal suffering. His daughter died in a car accident in 1988, and his final years were testing as his health declined. But he bore the vicissitudes with fortitude and dignity, and the civility that had characterised his dealings with friends, colleagues and readers. He left his wife Dianne and a large and adoring family.